We joined forces with my friend Cherish and her son, and started to debate about our theme. Obviously the costumes would have to be related. Geeky, but recognizable. When Cherish went to sign us up for the relay, she had to enter a team name, so we had to make a decision. Then Cherish had an inspiration. What if we named our team “One Does Not Simply Walk into Moorhead”? Since this year’s marathon course started on the bridge between Fargo and Moorhead, and crossed over into Moorhead as well, it was perfect. The name left us with no choice but to be characters from the Lord of the Rings. We decided that Cherish and I, being the shortest members of our group, would have to be the hobbit and the dwarf. 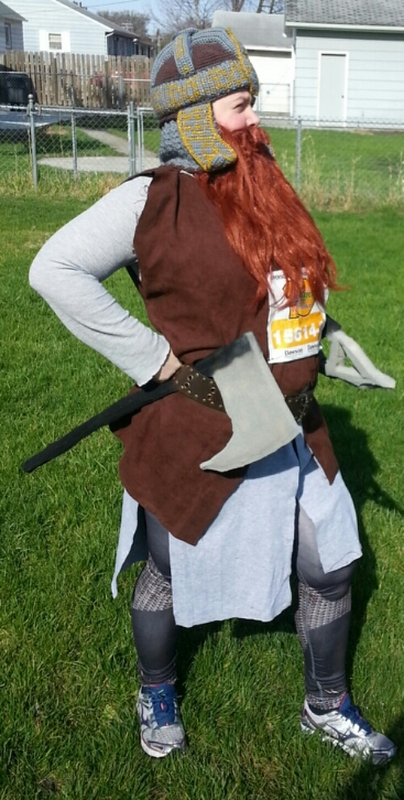 I actually thought it would be kind of fun to run in a beard (because I am weird like that), so I volunteered to be Gimli. The event went pretty well, I think, especially considering how little training we had all done. The rules of the Marathon state that you have only 7 hours to finish the marathon before they start to take down the course and you have to finish without support. We were worried that we wouldn’t finish in time and Ian would have to finish his run alone. However, we found that by the time we were running most of the crowd had already disbursed so we were mostly running alone anyway. We were the last relay team at every exchange point, and there were probably only a couple dozen full marathoners behind us. We finished the whole race in about 6-1/2 hours. During the few training runs I did beforehand, I was averaging about 18-19 minute miles so I figured it would take me about an hour and 45 minutes. I managed to finish my 5.5 miles in just about an hour and a half, which was a very pleasant surprise. — We saw lots of great outfits as we were waiting for Legolas to arrive at the exchange station. I think my favorite was the older guy dressed in full superman garb: tights, cape, and all. Later as I was running South, he passed me heading back North from the turnaround. He stuck out his hand and gave me a high five as he ran past. — Some of the runners had their names on the front of their shirts; I tried to call out to all of those people by name when I saw them. I figured it would be like having a friend cheering for you. — And my favorite, Where’s Waldo. All 4 of the team members had the stocking cap, striped shirt, and glasses. While waiting for her teammate to arrive, Waldo #3 turned around, said she loved our costumes and asked for a picture with us. Of course we had to get one with her too. I saw her at later, running back North as I was running South. We both gave each other a little cheer and a high five before running on. — One marathoner actually stopped running so he could come take a picture with Ian, saying “Gandalf, I’m a big big fan” before hopping back on the road. — I also saw a white-haired lady named “Nancy”, who was running her hundredth marathon. ONE HUNDRED FULL MARATHONS, you guys. Wow. — As I ran, occasionally people would call out to Gimli, but most people seemed to think I was a Viking. At first I corrected them but eventually I just let it slide. I figured if they weren’t geeky enough to recognize me on sight, then they would be happier thinking I was just a Viking anyway. For those people who recognized me before I passed the exchange point, I told them to hang around a couple of hours and they would see Gandalf. A couple of young girls volunteering at one intersection squealed with glee and looked around behind me like they thought he was coming any moment. It was adorable. — People kept asking if I was warm but surprisingly, I was actually quite comfortable. The materials for the clothing were pretty light weight and kept most of my skin covered so I didn’t feel the sun. Well, except for one spot. I didn’t even think about it at the time, but I should have put sunscreen on my cheeks, because today I have permantly rosy cheeks and a red nose. I look a bit like I’m drunk. — About 2 miles in, I passed behind the church which would served as the exchange point on my way back north. One of the spectators called out as I passed “HEY! We just saw your wizard friend!” I saw him too, but he was on the other side of the parking lot and too far for me to call out to him. 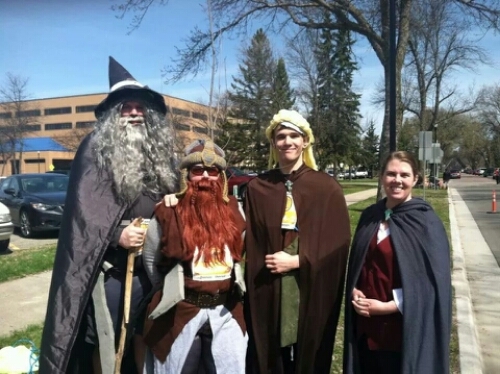 He told me later that someone walked up to him and told him that he had just missed Gimli behind the church, and he was surprised because it hadn’t occurred to me that he would get there before I did. — About a half mile past the church, my beard started to slip so I took off my helmet to fix it. Then I noticed one of the northbound runners had slowed down and began walking backwards. Once I got my hat back on he said “You’re the first dwarf I’ve seen on the course!” And took my picture. So obviously I told him to keep his camera ready at the church because Gandalf would be waiting there for me. — Lots of places along the route were playing music. As I ran through the southern tip of the course, I passed a house with a DJ and massive speakers set up. DJ-man saw me and said “Ooo let me guess, are you a Viking?” When I shook my head no, someone else said “She’s a dwarf, man”. Then he said “Let me guess. You spent more time on your costume than you did training for this run?” Obviously, he was right. — A bit over halfway through my relay section, I got a blister on my foot. So, yeah. I did a lot of walking after that and not so much running. — After I traded off with Ian, I had a nice chat with the volunteer at the exchange. She said her daughters were further back on the course and big fans of Lord of the Rings. So I told her I was pretty sure I had already met them. — After walking back to our car, I drove further up the course to cheer for Ian. I stopped at one corner and asked the volunteer if she had seen Gandalf. She blinked in surprise and said “Umm… actually, yes I did. If you drive to the other side of the park you will probably catch him there.” I’m sure she did not expect to see Gandalf that day, and having Gimli drive up looking for him must have pushed her straight into weirdsville. The best part of the whole race was at the very end. 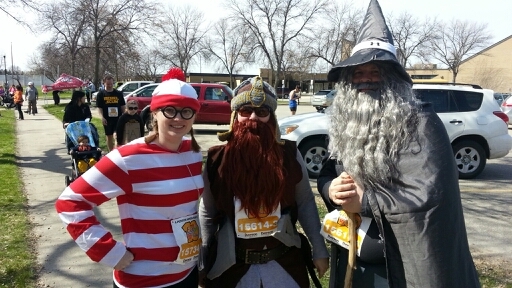 Frodo, Legolas and I sat on the bleachers near the finish waiting for Gandalf to come. 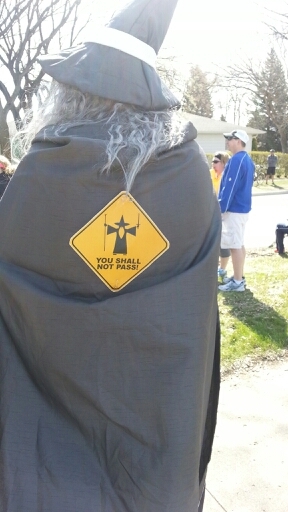 As we sat, one of the marathon volunteers rode up on a bicycle and said “So it WAS Gandalf!” We asked if he had seen him, and he said “oh yes! My daughters and I followed him from Concordia. ***** The girls were convinced that he was Dumbledore, but I thought he must be Gandalf.” Shortly after this exchange, we saw Ian coming and met up with him to cross the finish line together. The cheering was EPIC. It was totally worth it. * I bought the beard online and decided to make the rest of the costume. I was going to make my helmet out of cardboard or something but then one day Cherish and I stumbled across this awesome crochet pattern on Etsy. I can’t crochet, but Cherish can and she thought it would be fun so said she would make it. I bought the pattern and we ordered the necessary yarn online as well. I have to say the results were really impressive. Also, this is probably going to be my new winter hat for the rest of eternity. Sorry, TARDIS hat, you’ve been bumped. With the beard and the helmet accounted for, I decided to make my own tunic and vest. I’m no seamstress so it wasn’t perfect or authentic but it really just had to be close enough. The pants were a Mother’s Day gift from my kids: a pair of chainmail tights from Mitmunk, which I have been wanting for months. I decided at the last minute to throw in a couple of axes. I cut them out of foam which I spotted on someone’s curb during Spring Cleaning week, and spray-painted them with paint I got for free from the hazardous waste recycling center. ** I later learned that as he ran, my friend’s son would periodically call out “they’re taking the hobbits to Isengard!” Which is pretty awesome. **** The fake hobbit feet, cloak, and pin were purchased online. I’m actually not sure about the vest or the pants. They got the Legolas costume online and made the hair out of yellow yarn. We bought Ian’s beard and wig online. I made the cloak out of a curtain I found at a local thrift store. The hat was made from a wide-brimmed sun hat, with a paper cone attached to the top, and covered with the same curtain material I used for the cloak. The sword was made using the same foam and spray paint I used for my axes. The staff is a walking stick that I have had since college. Under the cloak, Ian is wearing a gray shirt and gray shorts which he already owned. ***** Concordia is a college on the Moorhead side of the river, about halfway through Ian’s portion of the run. OMG You shall not pass!!!!! I love it. Way to go you guys. Awesome! Looks like this was so much fun. That is great!!! I love your costume, very cool!